COP Series Stainless Steel Type Used Cooking Oil Purifier Machine is special for filtering waste cooking oil, dirty vegetable oil, trench oil, swill oil, animal oil etc. It effectively and completely removes particles, water, acid and alcohol etc. from the waste oil. The treated oil is clean, limpidity, and with good smell, so as to reach the edible standard again. COP Series is a good purification machine for fried food factory, oil restaurant, cooking oil factory, vegetable oil factory, and waste oil collecting store. 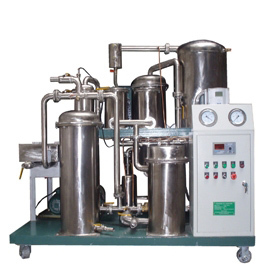 This plant is composed of two parts, one is the press filter, and the other is the vacuum oil purifier system. The press filter can remove the big or tiny impurities; The precision of purification can reach to 1 Micro. The vacuum system is equiped with filters of three grade (primary filter, mass water separator, and fine filer). All processes is under vacuum condition. The primary filter, which is made of the stainless steel, is anti-rust and anti-corrupt. It mainly removes the residual impurities which escape from the press filter, making sure the treated oil won't have any impurity when it goes into the water separator and vacuum separator. The water separator filter, which is equipped with a special filter, mainly removes the mass water from the oil. Usually the waste cooking oil contains much water and it need to be removed from the oil. After the water separator, the oil just contains the tiny water and soluble water. After the process of the water separator filter, the oil will goes into the vacuum separator which adopts three-dimensional duplex evaporation and film evaporation. 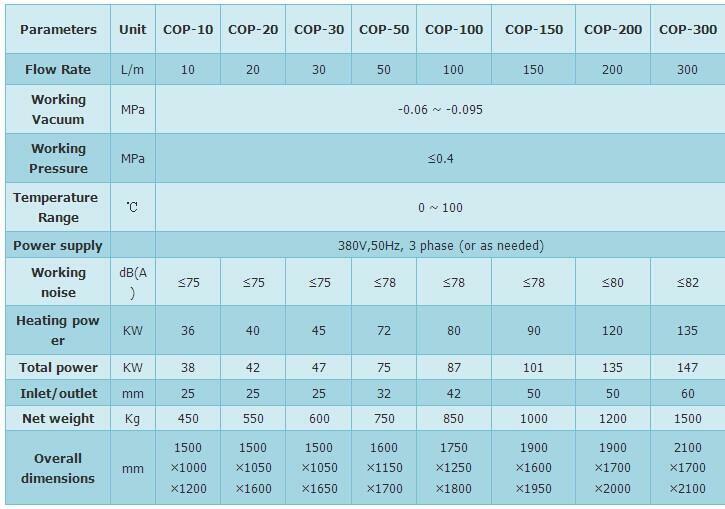 For protecting the oil nature, it is better that the oil temperature is lower than 80°c. Because our machine works under the vacuum and low pressure condition, so the oil doesn't need to be heated to 100 °c and usually it just need to be heated to 45 °c. Then the tiny water, soluble water, acid, alcohol, other volatility liquid and so on can be removed completely and effectively. For the fine filter, which is equips with the stainless steel filter, the purification hole is less than 1 Micro, which can make sure the filtered oil is completely clear without any impurity.